Writer and blogger specialising in alcohol-free beer, craft beer, hospitality and getting outdoors. 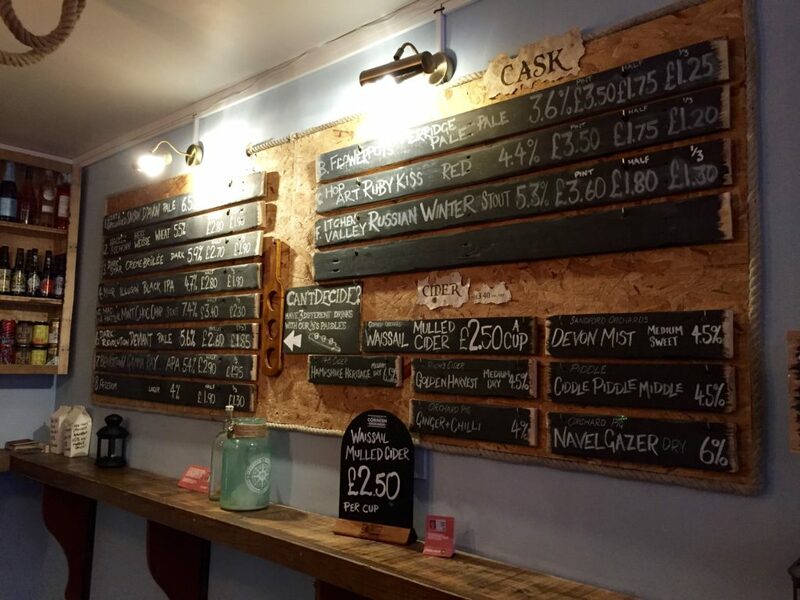 Find out how I got on when I did a mini pub crawl of some of Southampton’s newest craft beer bars and pubs – Olaf’s Tun, Caskaway, The Dancing Man, Belgium and Blues and Chalk Valley. Southampton is fast becoming the south coast’s premier destination for craft beer and real ale. 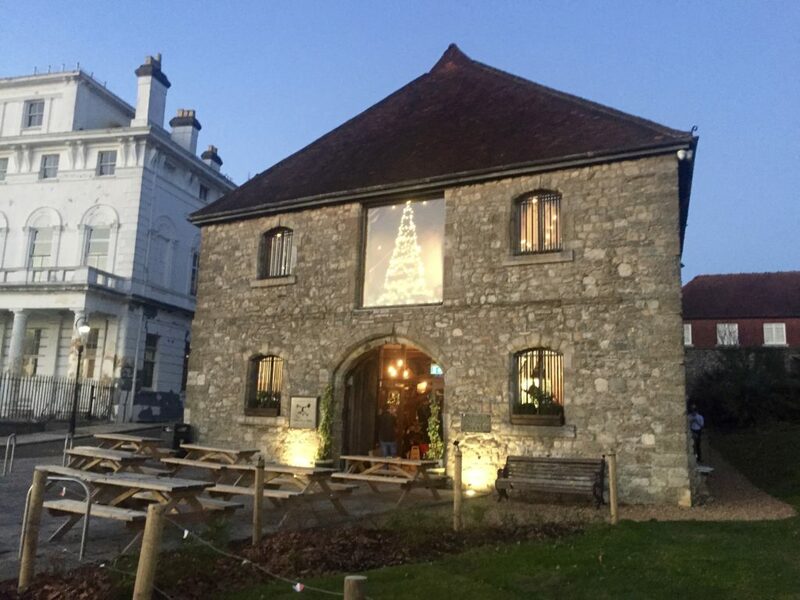 Not only do you have many excellent pubs and craft beer bottle shops dotted throughout the city, but there are also several new bars and micropubs focusing on great beer, much of it from Hampshire’s 35+ breweries. Most of my previous pub crawls in Southampton have centred around the Bevois Valley area of the city where there are a handful of good pubs in easy walking distance of each other. So, on a recent afternoon out with my friend Jamie, we decided to check out some of Southampton’s newer micropubs and bars in the southern part of the city. We started out at Olaf’s Tun, a micropub in Woolston, not far from where the River Itchen meets Southampton Water. Olaf’s is handy for Woolston train station, which is on the Southampton to Portsmouth line. Many local buses also pass close by if you don’t fancy the 1.5 mile walk from the city centre. It opened earlier this year in what was previously a convenience store. It’s named after a viking tun (fortified town), which was apparently situated in Woolston around the time of King Olaf I of Norway. We arrived at the bar around 2.30pm and made ourselves comfortable on a little table in the former shop’s window. Much of the seating is on high benches made from old wooden crates. It’s homely and comfortable. Beer is served from casks mounted on a scaffold stillage behind the bar. There are also a few keg beers available, plus wine and soft drinks. Spent kegs and casks are dotted around the pub, which adds to the relaxed atmosphere. There’s a decent mix of local and UK beers on offer. We just missed out on the last of the Red Cat “Prowler Pale”, which would have been the ideal beer to start the day. Instead, we started off the day with a “Chinook Pale” (5%) from Lymington’s Vibrant Forest brewery and followed it with another light beer, a “Sonoma” pale ale (3.8%) from Track Brewing Company in Manchester. We were only going to stay for a couple, but ended up ordering another beer from the north – a Brew York “Marris the Otter” (3.9%) bitter. We enjoyed Olaf’s and were sorry to have to leave. The prospect of a walk across the Itchen Bridge in the biting wind might have had something to do with it. 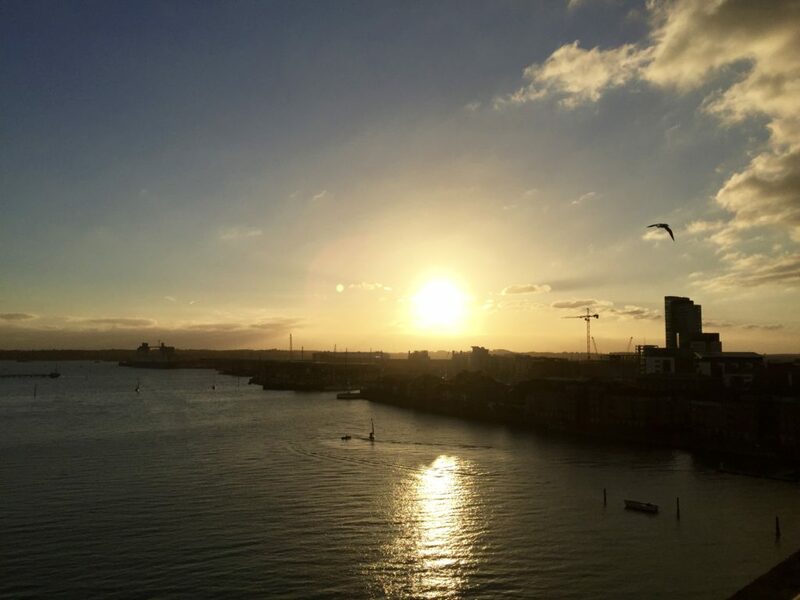 In the end, the stroll over the bridge wasn’t too bad and we soon found ourselves turning into Oxford Street where the next bar on our crawl – Caskaway – is situated. There was only one other customer when we arrived, and it wasn’t long until he left us free rein of this little bar. As you might have twigged from the name, Caskaway has a nautical theme drawing on the city’s links with the sea. It’s a bit more polished than Olaf’s, which isn’t a dig at either venue as they’re both decent in different ways. Like Olaf’s, there’s a lot of raised seating on benches (it leaves room for cask and keg storage underneath). There’s no bar here – there’s table service instead. Today the cask ale selection was focused on ales from the east Hampshire area with beers from Cheriton’s Flower Pots brewery, Alresford’s Itchen Valley and Farnham’s Hop Art. There was also an impressive keg selection with some beers from further afield, plus craft beer in bottles and cans. Bar snacks such as pork pies and scotch eggs are on sale too. We ended up with a half each of both the Flower Pots “Perridge Pale” (3.6%) – a light session ale – and the Hop Art “Ruby Kiss” (4.4%) – a red winter ale. As before, we could have happily spent more time in Caskaway. But, as the December afternoon darkened through the window, we decided to sup up and move onto the Dancing Man. The stroll to the Dancing Man took us alongside the attractive Queen’s Park and into the city’s “old town” area. It wasn’t long ago that this part of Southampton was in the doldrums. But it’s amazing how some swanky flats, new coffee shops and a few signs can spruce things up. The Dancing Man is at the southern end of the old town, housed in the Wool House – one of the city’s oldest buildings and formerly a medieval warehouse, a prison for POWs during the Napoleonic Wars and more recently, Southampton’s maritime museum. The Wool House was once on the shore of Southampton Water. Now the A33 road and ferry terminal are between it and the water’s edge. It’s still a pleasant place to sit outside in the warmer months. Jamie and I stumbled on the Grade I-listed Wool House one afternoon in our student days in the early 2000s when it was still a museum. Back then it was items rescued from the RMS Titanic that took centre stage alongside other less-tragic displays like a scale model of the city’s port. Now it’s all about beer and food served in what is still a spectacular setting following the building’s conversion to a pub and brewery. 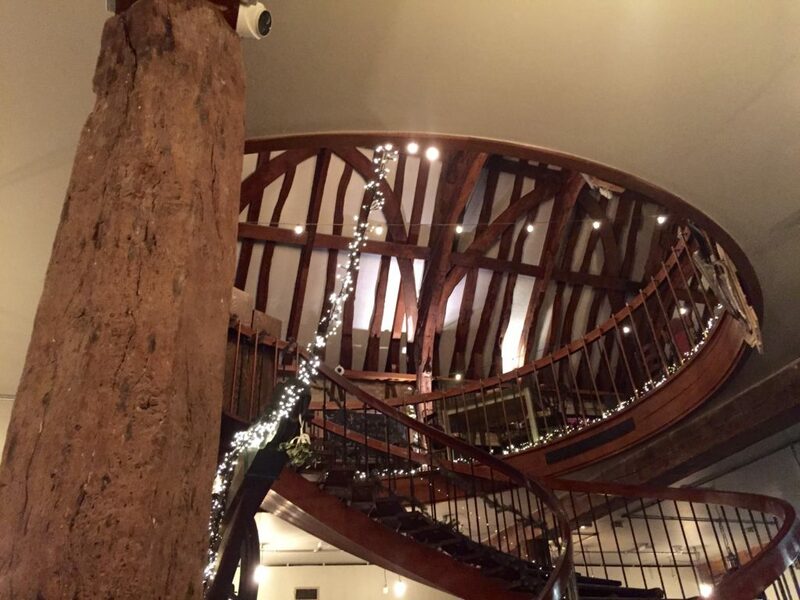 On entering through the huge doors at the centre of the building, the first thing that strikes you is the imposing spiral staircase that leads your eyes up to the magnificent beamed roof, which dates from the 14th century. Spread out behind the stairs is the bar, offering eight hand pumps showcasing six of the pub’s own brews plus a couple of guest ales. The pub’s onsite brewery is nestled behind the bar. Upstairs is mainly a restaurant and function room with its own smaller bar. The pub acts as a mini tourist information centre too, which is handy with the Isle of Wight ferry terminal opposite. Once we’d taken in the majesty of the place, we ordered a half each of the pub’s own “Big Casino” IPA (5.7%), a drink I’ve enjoyed on my previous visit to the Dancing Man. We then took a seat on a couple of the stools that are dotted around the edge of the room and watched the clear blue sky turn black through one of the pub’s old windows as nighttime arrived. For our second drink we went for one of the two Broken Bridge guest ales, “No Chaff” (4%). Broken Bridge is another Hampshire brewery, based in Swanmore near Bishop’s Waltham. It opened in the summer. No Chaff is an interesting, fruity IPA made from wheat malt. I rather enjoyed it even though it’s probably a drink more suited to the summertime. With food and several more Dancing Man beers available, including a black IPA, a bitter, a traditional pale ale and a red ale, it would have been easy to stay drinking in the cavernous-yet-cosy Wool House all evening, especially now the temperature outside had dropped significantly. Instead, we wrapped ourselves up and headed up Bugle Street through the western side of the old town towards the city centre. This route passes over many of the city’s medieval wine vaults and past several timbered-framed buildings. These include the Duke of Wellington pub, which dates from 1220, and the Tudor House, which dates from the 1500s. We then headed up under the West Quay shopping centre towards Guildhall Square to the east of the Civic Centre clock tower. As with our previous hops between pubs, this was a longish stroll, although there is a shuttle bus you can get from Town Quay (£1 each way and runs every half an hour), which is pretty much opposite the Dancing Man. As with the old town area, the city council has recently redeveloped Guildhall Square. It’s now an attractive open space, surrounded by cafes, restaurants and bars including a few independents and chains like The Stable, Turtle Bay and Gourmet Burger Kitchen. The next stop on our bar crawl – Belgium and Blues – is in the same row as some of the Guildhall Square buildings on Above Bar Street near two of the city’s parks. This bar focuses on good beer and Belgian-style food. I was partial to this pub in its former life as Goblets Wine Bar, so I was looking forward to seeing it in its new guise as we passed the street-level brasserie and descended the steps into the bar. On first glance, not much has changed. The low-ceilinged cellar retains a mixture of high tables and stools, comfy sofa-style seating and booths. And there’s still exposed brickwork, which contributes to the underground feel. However, once you get to the polished wooden bar you know that this place is now ultra-serious about its beer. Not only were there 14 beers available on draft tonight, but the fridges are also stacked full of a massive variety of bottles. There are a couple of draft ciders too. Food is available in the cellar in the evenings and in the street-level brasserie upstairs at lunchtimes and weekend evenings. The beers on draft tonight included the now familiar names of Dancing Man and Vibrant Forest and Hampshire’s newest brewery, Unity. Like Olaf’s and Caskaway, there were a few beers from further away, mostly from the south of the UK. Plus there were several kegged Belgian beers – not something you’ll get in most pubs in the city. Despite that impressive lineup, I again stayed close to home with a “Summerlands” (3.5%), a pleasant and refreshing session IPA and my second beer of the day from the Vibrant Forest brewery. 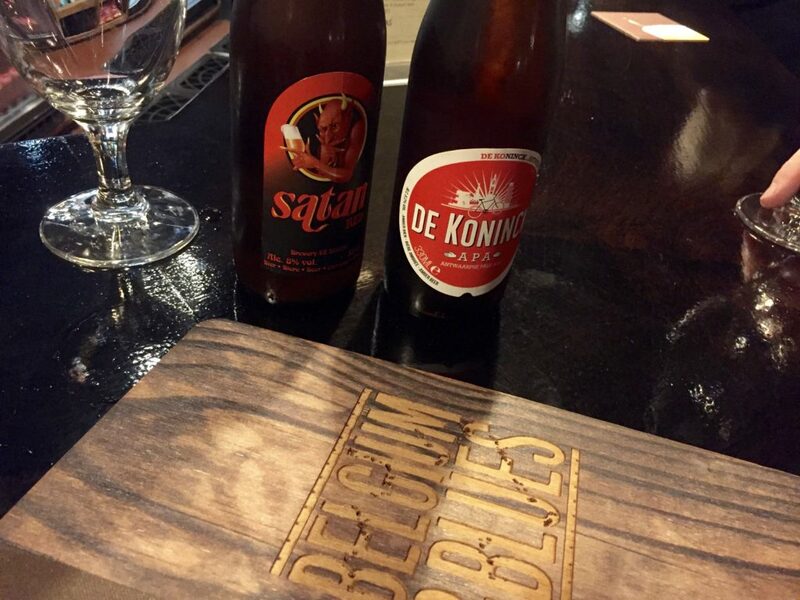 Then, in a vain effort to look like beer connoisseurs, we shared a couple of bottles of Belgian beers (De Block “Satan Red” (8%) and an “APA” (5.2%) from the De Koninck brewery) from one of the extensive wood-backed “beer bible” menus that were scattered about the bar. As with every venue we’d visited today, I’d have had no problem spending more time working my way through more beers at Belgium and Blues. Especially since there was a buzzy Saturday-evening atmosphere building up, which reminded me of some of the enjoyable nights I’d had in Goblets over the years. However, the prospect of a meat patty (or veggie patty in the case of Jamie) soon coaxed us up the wide steps to the street above and onto Chalk Valley burgers on nearby London Road. For me, the perfect burger experience has to include a good beer. This normally means eating in a pub. 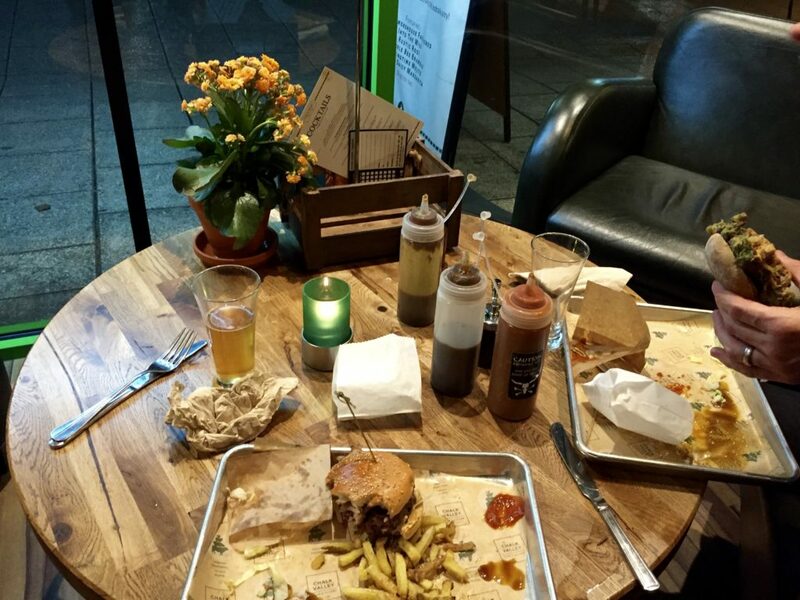 Not so with Chalk Valley, a place where great burgers and excellent craft beers come as standard. 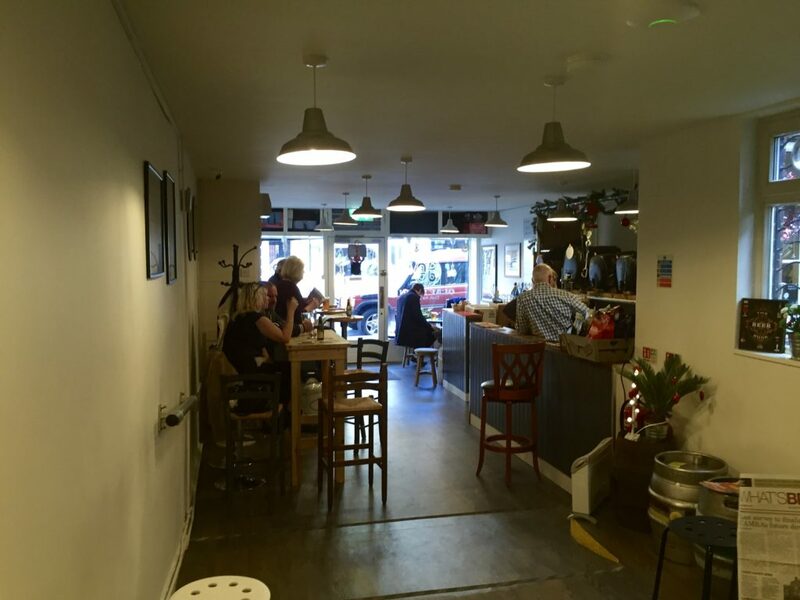 Chalk Valley is split into two sections: the left side is a more of a cafe/restaurant, while the right side is a newly opened bar that specialises in mostly local beers on keg and cask. You can eat in both sections, or nip into the bar area if you just fancy sampling one of the 10 beers available on draught. As you’ve probably noticed, I’d gravitated to mostly light beers this evening. My last drink of the day was on the same theme as I plumped for a “Pilsner” (4.8%) from Andwell Brewing Co – another Hampshire brewery – to go with my delicious buffalo burger. 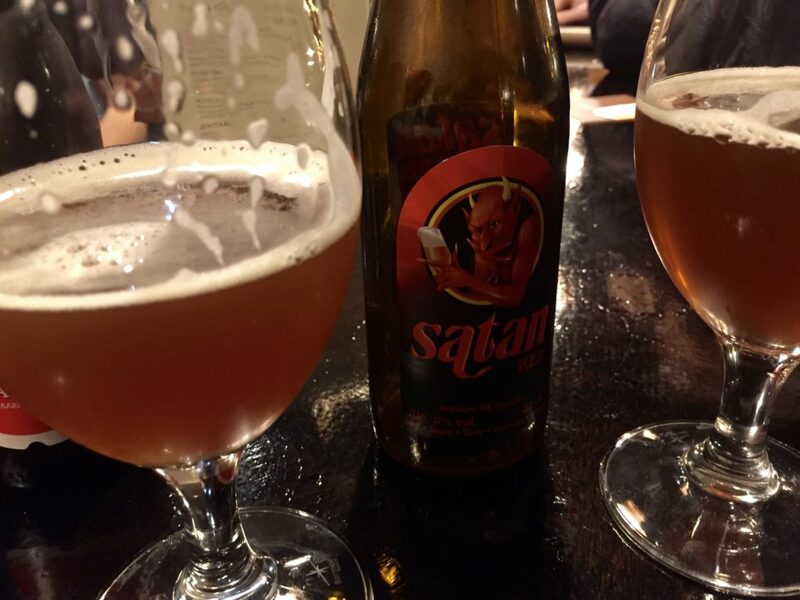 The beer wasn’t bad either – it was slightly spicy and nothing like the bland, mass-produced lagers many of us are used to. We’d barely touched the sides of Southampton’s craft beer scene on today’s tour of some of the city’s newest beer bars. We found some interesting venues with a varied selection of local, national and international beers and ales at fair prices. The best thing is that people who don’t drink or like beer will enjoy these places – whether it’s the homely atmosphere of Olaf’s Tun, the moderate quirkiness of Caskaway, the history lurking in the shadows of The Dancing Man, the continental feel of Belgium and Blues or the ethically sourced food at Chalk Valley. 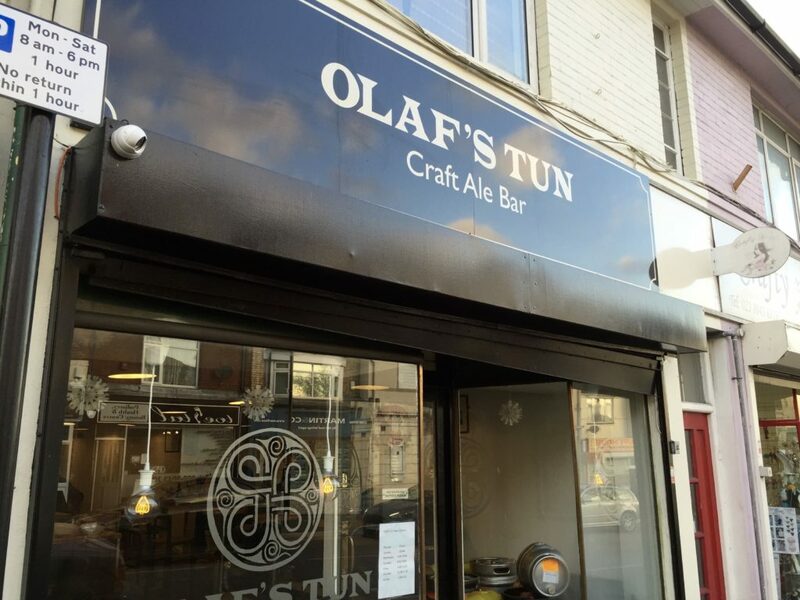 Info: Olaf’s Tun is at 8 Portsmouth Rd, Woolston, Southampton, SO19 9AA opposite the old cinema and a few minutes walk from the Itchen Bridge bus stop. Closed Monday and Tuesday. 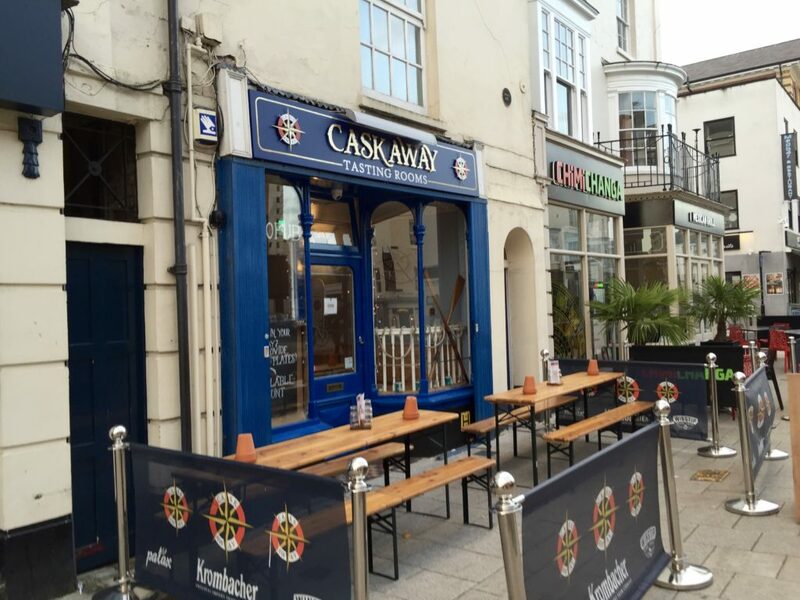 Caskaway is at 47 Oxford St, Southampton, SO14 3DP. Open daily. The Dancing Man is at 1 Bugle St, Southampton SO14 2AR. Open daily. 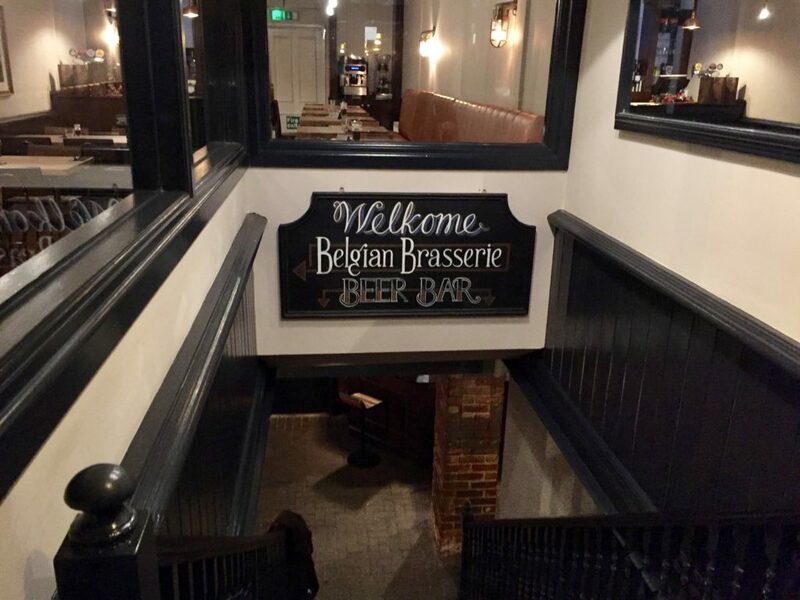 Belgium and Blues is at 184 Above Bar St, Southampton, SO14 7DW. Open daily with food available both in the cellar bar and the upstairs brasserie. Chalk Valley is at 37 London Road, Southampton, SO15 2AD. Open daily. Defo. I may have to make a weekend of it next time as there are so many good places now! Start at Unity micro brewery in Belgrave industrial estate, portswood. Newly opened but have some cracking craft ale on tap. Then walk from there to the Tramstop, bookshop ale house, guidedog then finish at The Rockstone. Sounds good Leanne! I was luck enough to get along to Unity a few weeks ago (I wrote about it here: http://thomashallett.com/unity-brewing-co-preview-night/). I haven’t made it to the Tramstop yet – any good? I'm a writer and blogger living near Southampton in Hampshire. I mostly write about alcohol-free beer, craft beer, hospitality and getting outdoors. The great keg beer rip off?